Peshmerga (Sorani Kurdish: پێشمەرگە‎, translit. Pêşmerge, lit. 'Before death', or 'Those who face death' IPA: [peːʃmɛɾˈɡɛ]) are the military forces of the federal region of Iraqi Kurdistan. Because the Iraqi Army is forbidden by Iraqi law to enter Iraqi Kurdistan, the Peshmerga, along with their security subsidiaries, are responsible for the security of the regions in Iraqi Kurdistan. These subsidiaries include Asayish (intelligence agency), Parastin u Zanyarî (assisting intelligence agency) and the Zeravani (military police). It has been argued[by whom?] that peshmerge itself predates Iraq, starting out as a strictly tribal pseudo-military border guard under the Ottomans and Safavids to a well-trained, disciplined guerrilla force in the 19th century. Peshmerga soldiers in Iraqi Kurdistan, 2016. Formally the peshmerga are under the command of the Kurdistan Regional Government's Ministry of Peshmerga Affairs. In reality the peshmerga force itself is largely divided and controlled separately by the two regional political parties: Democratic Party of Kurdistan and the Patriotic Union of Kurdistan. Unifying and integrating the peshmerga has been on the public agenda since 1992 but the forces remain divided due to factionalism which has proved to be a major stumbling block. In 2003, during the Iraq War, peshmerga were said to have played a key role in the mission to capture Saddam Hussein. In 2004, they captured key al Qaeda figure Hassan Ghul, who revealed the identity of Osama Bin Laden's messenger, which eventually led to Operation Neptune Spear and the death of Osama Bin Laden. The term "peshmerga" was only coined in the mid-20th century. Some[who?] suggest it was coined by the Kurdish writer Ibrahim Ahmad. Others however[who? ], such as Valentine states it was first used by Qazi Muhammad in the short lived Mahabad republic 1946–47. As stated above it is a combination of two Kurdish words; pesh meaning to confront or face, and the word Merg which means death. The literal word is defined as "one who faces death". The term is primarily used by Sorani speaking Kurds to refer to Kurdish forces in Iraq while Kurmanji speaking Kurds use the term "gerîla" for armed Kurdish forces in Turkey, Iran and Syria. The word is mutually intelligible to speakers of Persian. 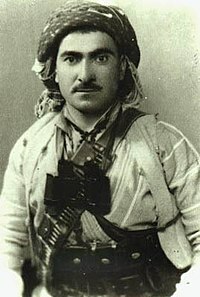 Mustafa Barzani was the primary political and military leader of the Kurdish cause until his death in 1979. The Kurdish warrior tradition of rebellion has existed for thousands of years along with aspirations for independence, and early Kurdish warriors fought against the various Persian empires, the Ottoman Empire and the British Empire. Historically the peshmerga existed only as guerilla organizations, but under the self-declared Republic of Mahabad (1946–1947), the peshmerga led by Mustafa Barzani became the official army of the republic. After the fall of the republic and the execution of head of state Qazi Muhammad, peshmerga forces reemerged as guerilla organizations that would go on to fight the Iranian and Iraqi governments for the remainder of the century. In Iraq, most of these peshmerga were led by Mustafa Barzani of the Kurdistan Democratic Party. In 1975 the peshmerga were defeated in the Second Iraqi–Kurdish War. Jalal Talabani, a leading member of the KDP, left the same year to revitalize the resistance and founded the Patriotic Union of Kurdistan. This event created the baseline for the political discontent between the KDP and PUK that to this day divides peshmerga forces and much of Kurdish society in Iraqi Kurdistan. After Mustafa Barzani's death in 1979, his son Masoud Barzani took his position. As tension increased between KDP and PUK, most peshmerga fought to keep a region under their own party's control, while also fighting off Iraqi Army incursions. Following the First Persian Gulf War, Iraqi Kurdistan saw the Kurdish Civil War between the two major parties, the KDP and the PUK, and peshmerga forces were used to fight each other. The civil war officially ended in September 1998, when Barzani and Talabani signed the Washington Agreement establishing a formal peace treaty. In the agreement, the parties agreed to share revenue and power, deny the use of northern Iraq to the Kurdistan Workers' Party (PKK), and not allow Iraqi troops into the Kurdish regions. By then, around 5,000 had been killed on both sides, and many more had been evicted for being on the wrong side. In the years after, tension remained high, but both parties moved towards each other and in 2003 they both took part in the overthrowing of the Baathist regime as part of the Iraq War. They remained on good terms, forming a government of Iraqi Kurdistan. Unlike other militia forces, the peshmerga were never prohibited by Iraqi law. 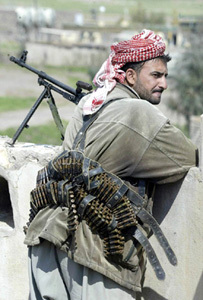 Iraqi Kurdish peshmerga fighter (KDP) in 2003. Peshmerga special unit near the Syrian border on June 23, 2014. The peshmerga are mostly divided among forces loyal to the Kurdistan Democratic Party (KDP) and those loyal to the Patriotic Union of Kurdistan (PUK), while other, minor Kurdish parties such as the Kurdistan Socialist Democratic Party also have their own small peshmarga units. The KDP and PUK do not disclose information about the composition of their forces with government or media. Thus there is no reliable number of how many Peshmerga fighters exist. Media outlets have speculated that there are between 150,000 and 200,000 peshmerga, but this number is highly disputed. Peshmerga have divided Iraqi Kurdistan into a KDP-governed "yellow" zone covering Dohuk Governorate and Erbil Governorate and a PUK-governed "green" zone covering Sulaymaniyah Governorate and Halabja Governorate. Each zone has its own branch of peshmerge with their own governing institutions and parallel peshmerga units that do not coordinate with the other branch . Due to limited funding and the vast size of the peshmerga forces, the KRG has long planned to downsize its forces from large numbers of low-quality forces to a smaller but much more effective and well-trained force. Consequently, in 2009, the KRG and Baghdad engaged in discussions about incorporating parts of the peshmerga forces into the Iraqi Army, in what would be the 15th and 16th Iraqi Army divisions. However, after increasing tension between Erbil and Baghdad regarding the disputed areas, the transfer was largely put on hold. 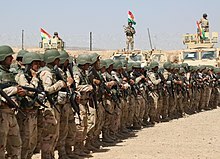 Some peshmerga were already transferred but reportedly deserted again, and there are allegations that former peshmerga forces remain loyal to the KRG rather than their Iraqi chain of command,regardless thousands of 80 Unit / KDP and 70 Unit / PUK are based in Baghdad and they have good cooperation with other Iraqi forces in Baghdad. The peshmerga forces are secular with a Muslim majority and Assyrian Christian and Yezidi units. Peshmerga soldiers stand in formation during the Modern Brigade Course graduation ceremony. Peshmerga forces largely rely on old arms captured from battles. The peshmerga captured stockpiles of weapons during the 1991 Iraqi uprisings. Several stockpiles of weapons were captured from the old Iraqi Army during the 2003 U.S. invasion of Iraq, in which peshmerga forces were active. Following the retreat of the new Iraqi Army during the June 2014 ISIS offensive, peshmerga forces reportedly again managed to get hold of weapons left behind by the Army. Since August 2014, peshmerga forces have also captured weapons from ISIS. In 2015, for the first time, peshmerga soldiers received urban warfare and military intelligence training from foreign trainers, the Combined Joint Task Force – Operation Inherent Resolve. The peshmerga arsenal is limited and confined by restrictions because the Kurdish Region has to purchase arms through the Iraqi government. Due to disputes between the KRG and the Iraqi government, arm flows from Baghdad to Iraqi Kurdistan has been almost nonexistent, as Baghdad fears Kurdish aspirations for independence. After the ISIS offensive of August 2014, multiple governments armed the peshmerga with some light equipment, such as light arms, night goggles and ammunition. However, Kurdish officials and peshmerga stressed that they were not receiving enough. They also stress that Baghdad was blocking all arms from reaching the KRG, emphasizing the need for weapons to be sent directly to the KRG and not through Baghdad. Despite this the United States has mainted that the government of Iraq is responsible for the security of Iraqi Kurdistan and that Baghdad must approve all military aid. The peshmerga lack a proper medical corps and communication units. This became apparent during the ISIS offensive in 2014 where the peshmerga found itself lacking ambulances and frontline field hospitals, forcing wounded fighters to walk back to safety. There is also a lack of communication tools as peshmerga commanders are forced to use civilian cellphones to communicate with each other. Under guidance of the US-led coalition the peshmerga has started to standardize its weapons systems, replacing Soviet-era weapons with NATO firearms. Women have played a significant role in the peshmerga since its foundation. The Kurdish Zand tribe was known for allowing women in military roles. During the Iraqi–Kurdish conflict the majority of women served within the peshmerga in supporting roles such as building camps, taking care of the wounded and carrying munitions and messages. Several women brigades served on the front lines. The most famous peshmerga was Margaret George Shello who managed to secure a leading position. The PUK started recruiting women during the Kurdish Civil War. Women were given a 45-day basic training that included parade drills and basic marksmanship with various rifles, mortars, and RPGs. In the months leading up to the US 2003 invasion of Iraq, the United States launched Operation Viking Hammer which dealt a huge blow to Islamic terrorist groups in Iraqi Kurdistan and uncovered a chemical weapons facility. The PUK later confirmed that women Kurdish fighters had participated in the operation. The modern peshmerga is almost entirely made up of men while having at least 600 women in their ranks. In the KDP, these women peshmerga have so far been refused access to the frontline and are mostly used in logistics and management positions, but women PUK peshmerga are deployed in the front lines and are actively engaged in combat. The peshmerga forces are plagued by frequent allegations of corruption, partisanship, nepotism, and fraud. A common result of corruption in the peshmerga are "ghost employees" which are employees on paper who either do not exist or do not show up for work but receive a salary. Those setting up such a scam split the salary of these employees. In addition the KDP and PUK have used the peshmerga to exert, or attempt to exert, a monopoly on the use of force within their zones. In 2011 KDP peshmerga fired on anti-government protesters in Sulaymaniyah on and the PUK later used its own security forces to break up these protests. Leading to criticism from all of the opposition parties in the parliament. In 2014 the KDP used its peshmerga to stop ministers from the Gorran Movement to enter Erbil and attend parliament. Outside of Iraqi Kurdistan the peshmerga has been accused of using force to exert control of local Arab, Yazidi and Assyrian communities. Particularly after taking control of areas officially outside of Iraqi Kurdistan during the Iraqi Civil War. ^ "Peshmerga and the Ongoing Fight against ISIS". March 27, 2016. Retrieved July 31, 2018. ^ "Iraqi PM criticizes Kurdish region for barring army from Syrian border area". Xinhua News Agency. July 28, 2012. Retrieved February 13, 2015. ^ "Information about Kurdistan". Kurdistan Development Organization. 2014. Retrieved February 13, 2015. ^ "Summary of the most important tasks of the Ministry of Peshmerga". Ministry of Peshmerga. November 12, 2012. Archived from the original on January 12, 2015. Retrieved February 13, 2015. ^ Newton-Small, Jay (December 31, 2012). "Destination Kurdistan: Is This Autonomous Iraqi Region a Budding Tourist Hot Spot?". Time. Retrieved February 13, 2015. ^ Druzin, Heath (September 29, 2013). "Rare terrorist attack in peaceful Kurdish region of Iraq kills 6". Stars and Stripes. Retrieved February 13, 2015. ^ Krajeski, Jenna (March 20, 2013). "The Iraq War Was a Good Idea, If You Ask the Kurds". The Atlantic. Retrieved February 14, 2015. ^ a b c d e f g Lortz, Michael (2005). "Willing to Face Death: A History of Kurdish Military Forces - the Peshmerga - From the Ottoman Empire to Present-Day Iraq". Electronic Theses, Treatises and Dissertations. 1038: 108. Archived from the original on July 27, 2015. Retrieved February 12, 2018. ^ a b c d e f g h i j k l m n o van Wilgenburg, Wladimir; Fumerton, Mario (December 16, 2015). "Kurdistan's Political Armies: The Challenge of Unifying the Peshmerga Forces" (PDF). Carnegie Middle East Center. Retrieved February 12, 2018. ^ Rai, Manish (October 6, 2014). "Kurdish Peshmerga Can Be A Game Changer In Iraq And Syria". Khaama Press. Retrieved February 14, 2015. ^ "Operation Red Dawn's eight-month hunt". The Sydney Morning Herald. December 15, 2003. Retrieved February 14, 2015. ^ Ambinder, Marc (April 29, 2013). "How the CIA really caught Bin Laden's trail". The Week. Retrieved February 14, 2015. ^ Roston, Arom (January 9, 2014). "Cloak and Drone: The Strange Saga of an Al Qaeda Triple Agent". Vocativ. Retrieved February 14, 2015. ^ Valentine, Peshmerga: Those who Face Death, 2018, chapter five. ^ Stratton, Allegra (June 26, 2006). "Hero of the people". New Statesman. Retrieved February 14, 2015. ^ Koerner, Brendan (March 21, 2003). "What does the Kurdish word peshmerga mean?". Slate.com. Retrieved October 18, 2016. ^ Valentine, Those Who Face death, KDP, 2018. ^ "پێش pêš | فەرهەنگی زمانی یەکگرتووی کوردی هاوچەرخ". ferheng.info (in Kurdish). ^ "مەرگ merg | فەرهەنگی زمانی یەکگرتووی کوردی هاوچەرخ". ferheng.info (in Kurdish). ^ Stilo, Donald (March 2008). Aspects of Iranian Linguistics. Cambridge Scholars Publishing. Retrieved October 19, 2017. ^ S. R. Valentine, Peshmerga: Those Who Face Death, KDP, 2018, see the introduction and chapter one. ^ Abdulla, Mufid (June 12, 2011). "Mahabad – the first independent Kurdish republic". The Kurdistan Tribune. Retrieved February 14, 2015. ^ a b c "President". Kurdistan Regional Government Representation in Spain. 2015. Retrieved February 14, 2015. ^ Meiselas, Susan (2008). Kurdistan: In the Shadow of History (2nd ed.). University of Chicago Press. ISBN 978-0-226-51928-9. ^ S. R. valentine, Peshmerga: Those Who Face Death, KDP, 2018, chapter six. ^ Abdulrahman, Frman (February 23, 2012). "never ending mystery: what really happened to Kurdish civil war missing". niqash. Retrieved February 22, 2015. ^ McDermid, Charles (February 20, 2010). "New force emerges in Kirkuk". Asia Times Online. Retrieved February 22, 2015. ^ a b c d e f g h i j k l m n o p q r Helfont, Samuel (March 1, 2017). "Getting Peshmerga Reform Right: Helping the Iraqi Kurds to Help Themselves in Post-ISIS Iraq". Foreign Policy Research Institute. 16: 13. ^ "Kaka Hama, head of Kurdish Socialist Party joins Mosul battle plan with force". Rudaw Media Network. October 16, 2016. Retrieved February 24, 2018. ^ "Over 150,000 enlisted as Peshmerga troops in Kurdistan Region, official data shows". Rudaw. April 3, 2017. Retrieved August 13, 2017. ^ Hawramy, Fazel (January 13, 2015). "Kurdish peshmerga divisions hamper war effort". Al-monitor. Retrieved February 12, 2018. ^ Chapman, Dennis. Security Forces of Kurdistan Regional Government, US Army War College. 2009, page. 3. ^ S. R. valentine, Peshmerga: Those Who Face Death, KDP, 2018, chapter 9. ^ "Lebanonwire.com – Kurdish Peshmerga Forces Have Room to Grow". lebanonwire.com. Archived from the original on January 13, 2015. ^ a b c Howard, Michael (November 26, 2002). "Revenge spurs women's army". The Guardian. Retrieved February 13, 2018. ^ a b "Peshmerga Ministry reforms launched to reunify PUK, KDP forces". Retrieved July 31, 2018. ^ Baxtiyar Goran (March 9, 2017). "Haider Shesho: Ezidkhan Units take orders from President Barzani, Peshmerga Ministry". Kurdistan24. ^ "Withdrawal from Iraq". Retrieved March 20, 2015. ^ "Iraqi Kurdistan Armed Forces, Peshmerga, to Lose 130,000 Soldiers". Retrieved March 20, 2015. ^ "Iraq and the United States". Retrieved March 20, 2015. ^ Chapman, Dennis. Security Forces of Kurdistan Regional Government, US Army War College. 2009, page. 112. ^ "Peshmerga, Iraqi Army form committees to start joint ops in disputed areas". Rudaw. ^ "1,000 Kurdish soldiers desert from Iraqi army". Hurriyet Daily News. Retrieved March 20, 2015. ^ "Iraq's Insurgency and the Road to Civil Conflict". Retrieved March 20, 2015. ^ "Iraq's army and Kurds will join forces to retake Mosul". PRI. ^ "KDP Plan New Ministry to Improve Relations with Baghdad". Millet Press. ^ "Iraqi-Kurdish cooperation in Kirkuk is vital for defeating Islamic State". The New Arab. ^ "Peshmerga politics, Kurdistan and the Iraqi state". CRU. ^ "Iraqi Kurds, Yazidis fight Islamic State for strategic town of Sinjar". Reuters. Retrieved March 20, 2015. ^ "Mosul Christians form army under Peshmerga direction". Rudaw. Retrieved March 20, 2015. ^ "Iraqi Defense Ministry Asks KRG To Return Saddam-Era Weapons - Al-Monitor: the Pulse of the Middle East". Al-Monitor. Retrieved March 20, 2015. ^ Hugh Naylor. "As ISIL retreats, Iraqi Kurds gain new ammunition". The National. Retrieved March 20, 2015. ^ Richard Spencer, The Telegraph (October 3, 2014). "Kurdish forces captured an ISIS base after a two-day siege — but the ISIS fighters inside somehow slipped away". National Post. Retrieved March 20, 2015. ^ "EXCLUSIVE: Coalition helps Peshmerga muscle up on urban warfare". Rudaw. April 16, 2015. Retrieved April 17, 2015. ^ Hollie McKay. "Iraq's Peshmerga desperate for US arms in fight against ISIS". Fox News. Retrieved March 20, 2015. ^ "Arms for Kurdish peshmerga to affect military balance". Deutsche Welle. Retrieved March 20, 2015. ^ Nicholas Watt. "UK prepares to supply arms directly to Kurdish forces fighting Isis". The Guardian. Retrieved October 23, 2014. ^ "Seven western states join US to arm Iraqi Kurdistan: Pentagon". ekurd.net. Retrieved October 23, 2014. ^ Spencer Ackerman. "US to directly arm Kurdish peshmerga forces in bid to thwart Isis offensive". The Guardian. Retrieved March 20, 2015. ^ "Greece to send ammunition to Iraqi Kurds". Retrieved September 27, 2014. ^ "Iraq's Kurds appeal for new U.S. arms to combat Islamic State". Washington Post. Retrieved March 20, 2015. ^ "Iraqi Kurds say West not providing enough arms to defeat Islamic State". Reuters. Retrieved March 20, 2015. ^ Plan of Attack, Bob Woodward, Simon and Schuster, 2004. ^ "Ansar al-Islam". Federation of American Scientists. Retrieved August 8, 2012. ^ "Meet the Kurdish women fighting the Islamic State". Telegraph. November 8, 2014. Retrieved March 20, 2015. ^ "No Frontline Deployment for Female Kurdish Troops". Rudaw. Retrieved March 20, 2015. ^ "KRG halts recruiting of female Peshmerga". Rudaw. ^ "Meet the female peshmerga forces fighting IS". Al-Monitor. ^ "The Peshmerga of Iraq". Aljazeera.com. March 1, 2008. Retrieved February 22, 2015. ^ "KRG and the 'godfathers': 2006 secret US cable on Wikileaks". The Kurdistan Tribune. May 8, 2014. Retrieved February 22, 2015. ^ Devigne, Jacqueline (2011). ""Iraqoncilable" Differences? The Political Nature of the Peshmerga" (PDF). NIMEP Insights. Retrieved February 22, 2015. ^ "Presidency of the province renews its call to convert the Peshmerga Army National". The I.Q.D. Team Connection. Archived from the original on January 13, 2015. Retrieved March 20, 2015. ^ "PUK official warns Peshmerga will not take orders from anyone else: Iraqi Kurdistan". Retrieved March 20, 2015. ^ "Marked With An "X" | Iraqi Kurdish Forces' Destruction of Villages, Homes in Conflict with ISIS". Human Rights Watch. November 13, 2016. Retrieved April 24, 2018. Simon Ross Valentine, Peshmerga: Those Who Face Death, The Kurdish Army, its History, Development and the Fight against ISIS, Kindle Direct Publishing, April 2018, 300pp. Chapman, Dennis P., Lieutenant Colonel USA, Security Forces of the Kurdistan Regional Government, Mohammed najat, Costa Mesa, California: Mazda Publishers, 2011. ISSN 0026-3141 Reviewed by Michael M. Gunter in Middle East Affairs, Vol. 65, No. 3, Summer 2011.